ver the past three years, my primary instruments have become the 16- and 17-string Contraguitars. They've been my first-choice instruments on several albums. The vast range and registers, the tonal flexibility, and the seemingly endless ranges of expression available on it make me never want to put it down. The Contraguitar is home. Since about 2008, my secondary instrument has been the 12-string Alto guitar. Its unique voice, almost that of a harpsichord, is very beautiful. The Alto is tuned a fourth above standard concert pitch, so this allows it to carve out its own harmonic territory when used in duet or trio settings. It's often tuned higher than A and capoed up to E, making it a full octave above concert tuning; in this role, it becomes the alto guitar. I have had thoughts of trying to devise a system which would place the Alto on a stand, in playing position, in front of me. In this way, I could access the alto and alto registers without having to switch from the Contraguitar; I could utilize the vastly different registers of both instruments within a single composition, moving between and combining the two instruments at will. I then started thinking of the possibility of a doubleneck instrument which contained both the Contra and Alto: a Contra-Alto guitar. Furthermore, not merely to play the two halves as two separate instruments, but to play both halves as a whole: to combine the full registers of both instruments, of both necks, as one. To see both necks as a singular instrument with an astonishingly wide range. Playing both sets of strings, simultaneously, as one instrument. I thought about this instrument for a few years. I had thought about this at various times; attempting to solve arduous instrument design problems, any of which could derail the project. 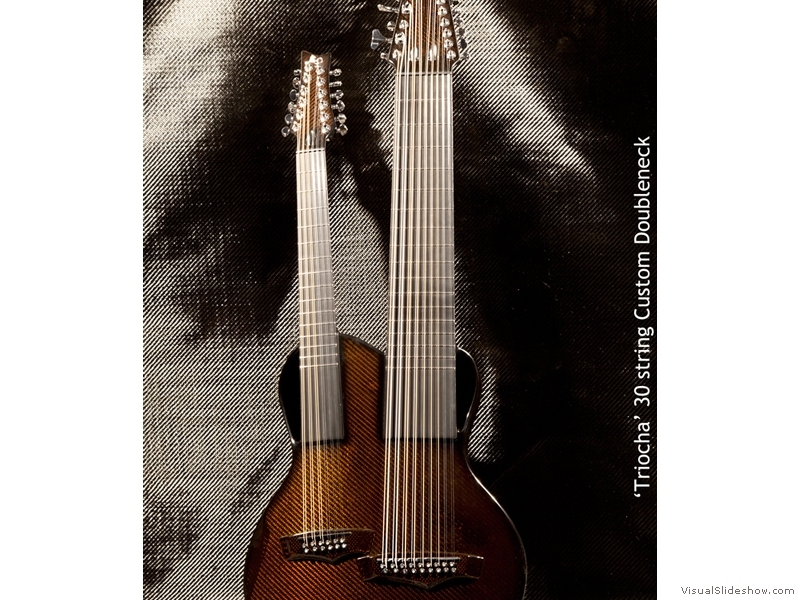 My main concern was that in order for a single instrument to structurally support 28 strings, the construction would necessitate massive strength. String instruments are already a delicate balancing act between lightweight construction for resonance and tone, juxtaposed with the constant forces of string tension which continually threatens to destroy the instrument. An instrument with the required structural integrity is almost certain to have a vastly reduced resonance, due to the massive and weighty build structure. I felt at an impasse. I had all but resigned myself that such a massive instrument could never exist, due to the limitations, or more accurately, physics of tonewood luthiery. Yet the thoughts of it never left me. 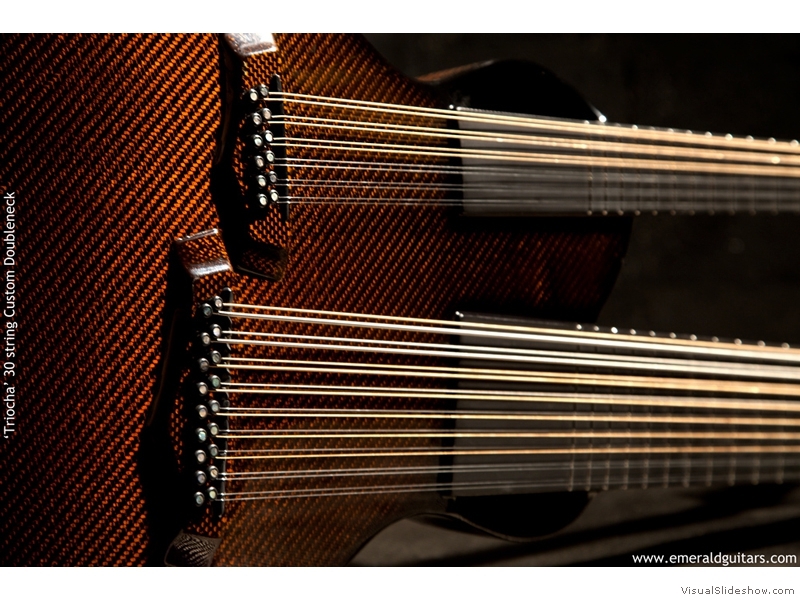 Spring 2012: I heard of a company in Ireland that was exploring new possibilities with carbon fiber instruments. That company was Emerald Guitars, helmed by the intrepid Alistair Hay. I contacted Alistair, explained the instrument I had in mind, and asked if it would be possible and if so, if he'd be interesting in building it. I heard back from Alistair. He was indeed interested. I put together the first draft of the specifications and sent it off to him. We began a correspondence, and discussed all manner of details, from design to voicing and more. After our first conversation, I knew I'd met a kindred and adventurous spirit. 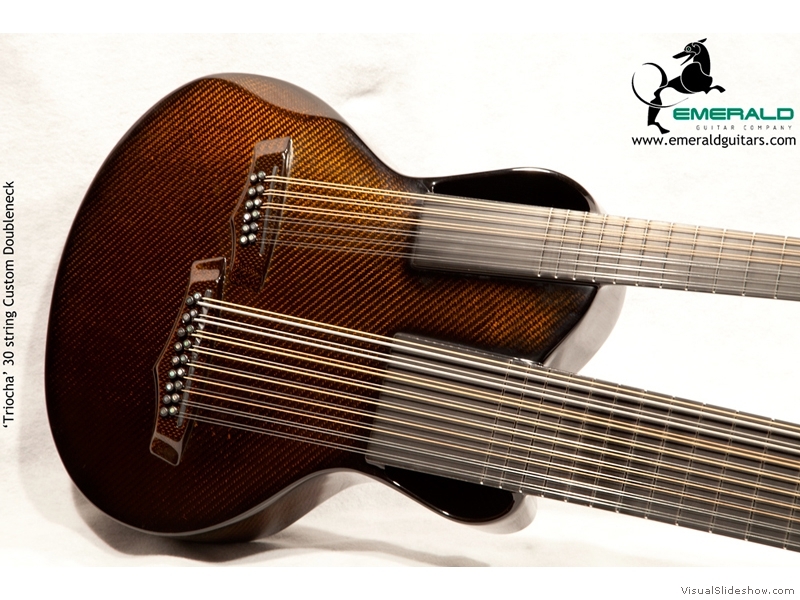 July 2012: Alistair sent an Emerald Chimera 6/12 doubleneck prototype to me for a couple of weeks. He wanted me to spend some time with it, to find out which design elements we could use from the Chimera on the 30-string. This proved to be a very wise move on his part, as the 6/12 answered various questions. Issues such as which neck would be on top, body dimensions, body depth, bridge placements, and more all came into focus. The Chimera made me realize that we could go beyond 28 stings. I knew this instrument could support a low B course on the Contra side, bringing the string count to 30. I finalized the specifications, and Alistair began work on the 30. Alistair Hay: "When Kevin first approached me about his concept last year I was instantly intrigued. Carbon is the perfect material for Ultra high tension instruments such as this and after building a number of 6/12 double neck guitars I couldn't resist the challenge of taking that further. It was great working with Kevin on the project as he had a very clear idea of what he wanted and this helped create focus from the start. It required a completely new mindset to bring this guitar to life, thinking about new scale lengths, tunings and unprecedented tension but this is what excites me. It forced me to learn more about my art and many things learned along the way will surely equip me better for future builds. 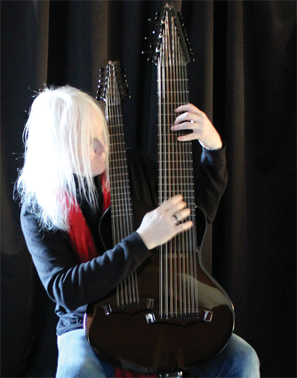 After working on the design for nearly six months it was only when the last of its 30 strings were tuned that I knew for sure that it was a success. It was a privilege to have been able to bring Kevin's vision to life and I look forward to hearing the music he finds within Triocha." Autumn 2012: As it began to take shape, Alistair sent progress photos. This was encouraging, as I watched an instrument slowly come to life that I had previously thought impossible. We spoke periodically to discuss design and construction challenges. In late December 2012, Alistair contacted me and let me know that he was getting close. Neither of us had a name in mind for the instrument, so we batted around a few possibilities. Alistair suggested "triocha," as this is the word that means "thirty" in Gaelic. I liked it, and the instrument was named. 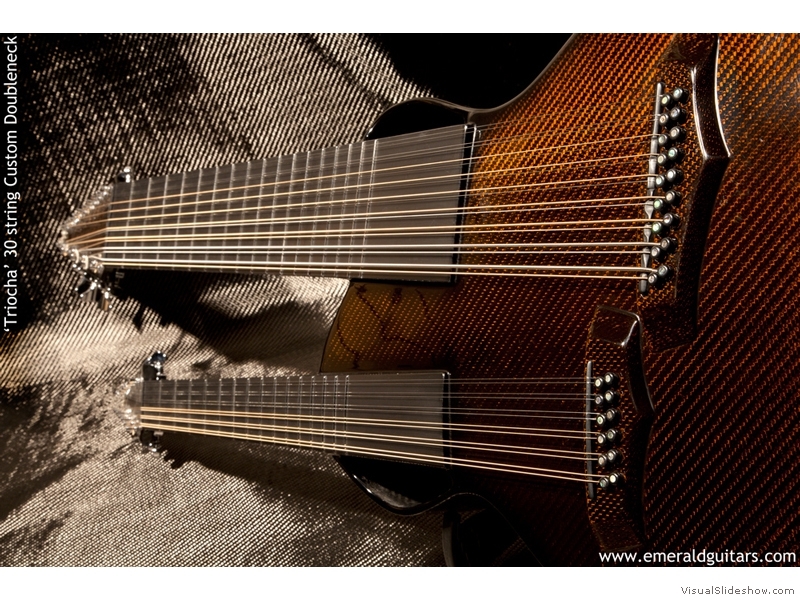 In mid-January 2013, the Emerald 30-string Chimera Triocha doubleneck arrived. 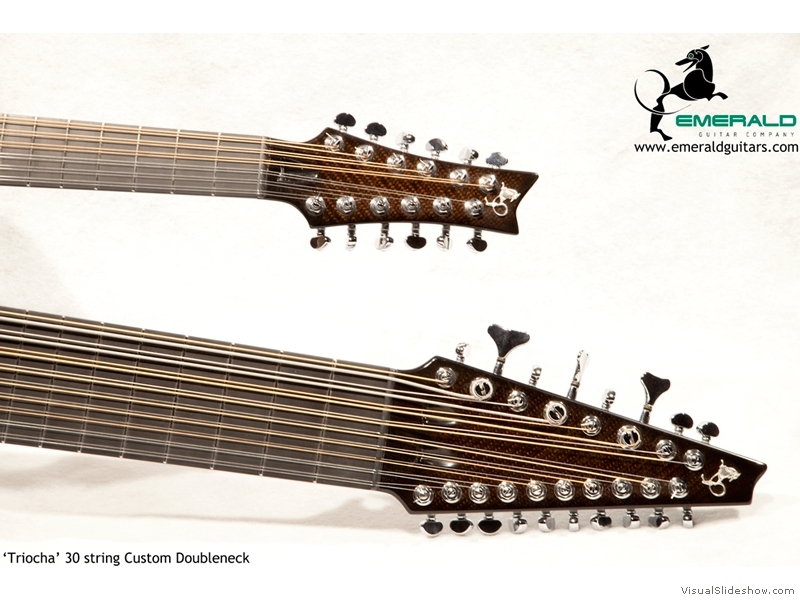 From the Emerald website: "Over the past couple of years we have been developing our double neck guitars and this culminated in the creation of the Chimaera which is our production 12 and 6 string double neck acoustic. 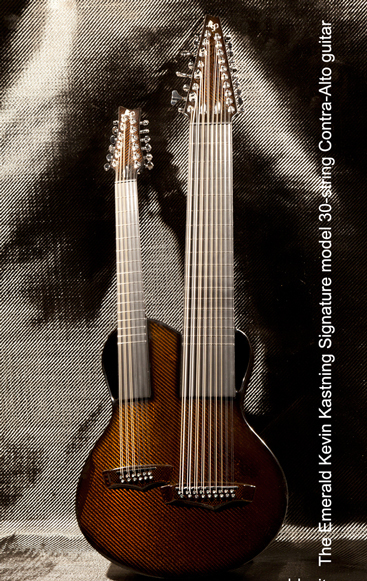 We thought this was pretty exotic with its 18 strings until along came Kevin Kastning with an idea for a 30 string. 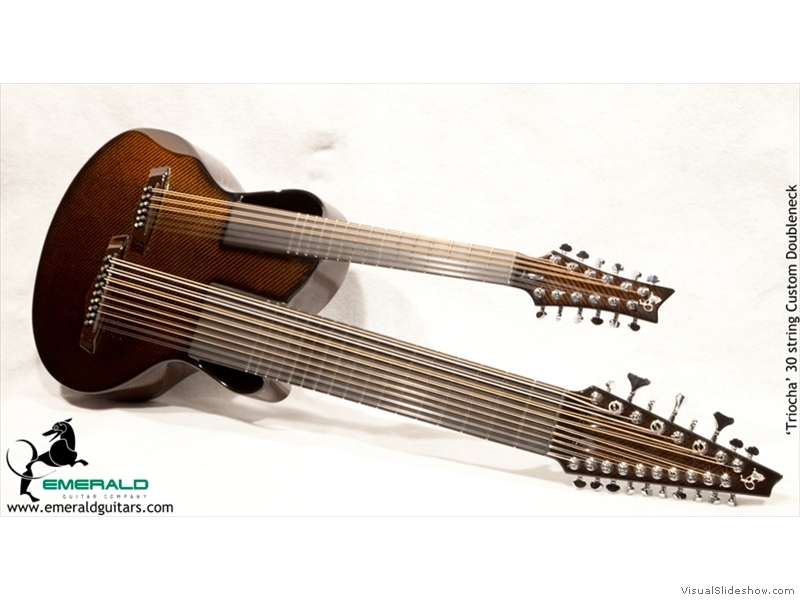 Actually it started life as a 26 string but that just seemed a little too tame. Kevin has been making waves in the acoustic world in the past few years with his 16 string and 17 string Contraguitars and his Alto guitars so he knew what he wanted. We collaborated on the design over a period of a few months through lengthy Skype calls and eventually we finalized a design and then came a further 5 months of construction. The guitar has an 18 string Contra neck and a 12 string Alto neck so its got an incredible range but with all those strings and range comes an incredible amount of tension. It required a whole new approach to build this guitar and a massive step into the unknown but I enjoy a challenge and I have to say it was worth all the effort. 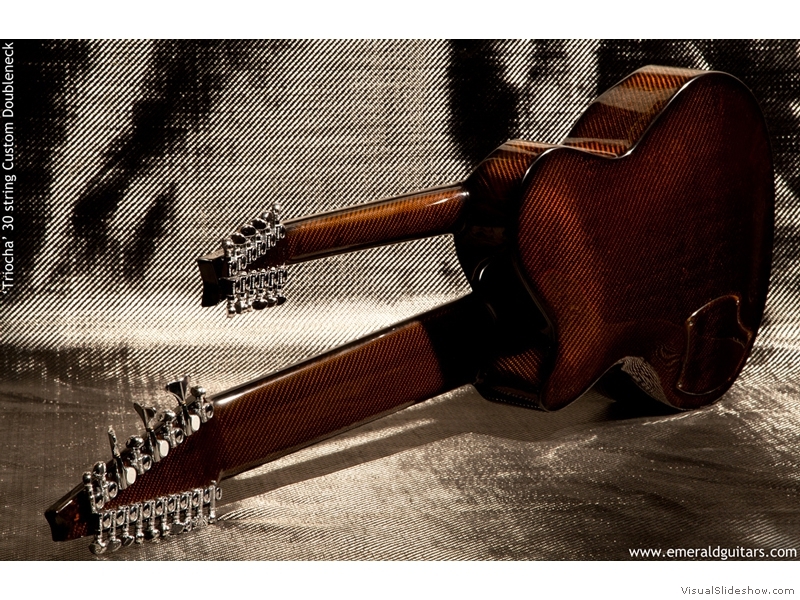 It was only when the last string was tuned that we could fully appreciate what we had created. The guitar has a huge sound with incredible dimension and depth and despite the extreme tension we were able to create a very accurate neck making it way easier to play than it looks. Ok its beyond my playing skills but Kevin assures me its easy to play. Kevin has already had the guitar in the studio and I patiently await the results. January 2013: The instrument is wondrous. It is a success in every way: the playability and setup are excellent. The voice reminds me of something of a cross between a lute and a harpsichord with a pipe organ in the lowest bass registers. 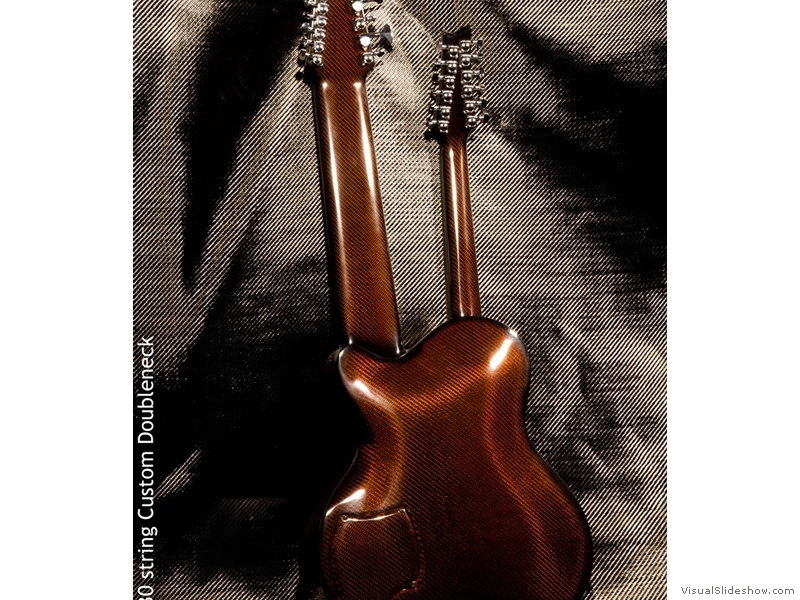 The dual soundholes make for a true stereo instrument. On tape, it sounds massive and huge; yet retains an intimate delicacy. The Triocha demands some new techniques; one notable difference is that I play it vertically, like a cello. This may look unorthodox, but is actually very comfortable and provides equal access to all registers. 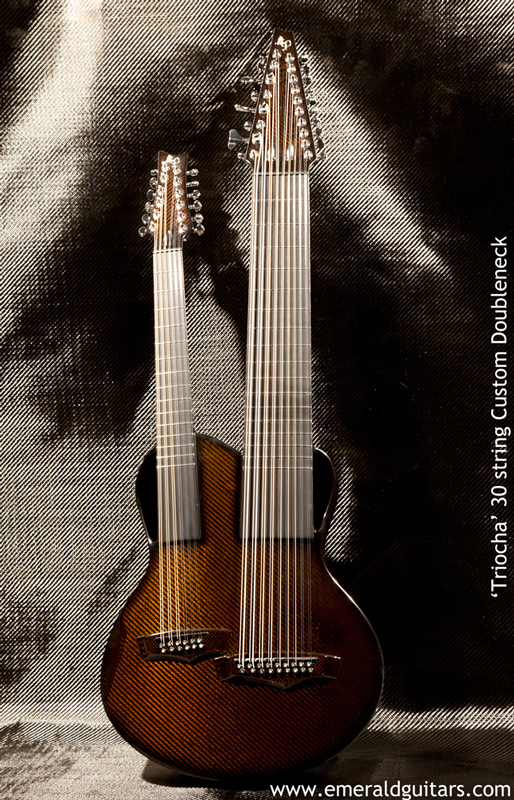 Within five days of receiving it, the Triocha was on its first studio recording date. Its first recorded appearance will be on the forthcoming album of myself and Carl Clements, to be released in spring 2013 on Greydisc Records. There are other album projects already scheduled for 2013 and beyond for which the Triocha will be heavily involved. While I will be using the Triocha constantly in the recording studio, certainly it is the perfect instrument for international concert tours, and will be pressed into service in that role, too. As testament to my feelings about the Triocha, Alistair and I are already discussing another possible project. To Alistair and everyone at Emerald Guitars, my sincerest gratitude. Epilogue: The Emerald Triocha is my second carbon fiber instrument. 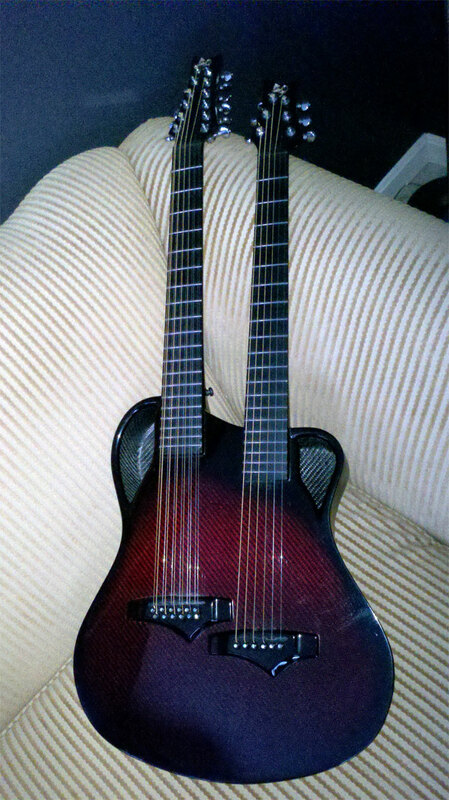 In 2012, I acquired a 12-string RainSong J that I have set up as a 12-string baritone. I like it very much, and have used it on a few recording sessions. 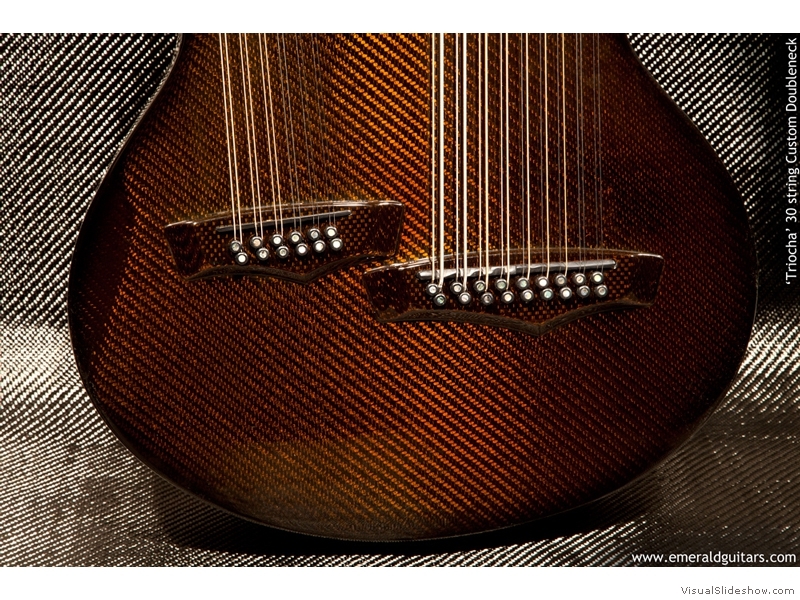 I've heard various discussions among guitarists and luthiers regarding carbon fiber, sometimes known as composite or graphite, versus wood instruments. The prevailing sentiment seems to be that carbon fiber instruments could never be as good as wood instruments. Sidestepping the sticky issue of what is the definition of "good" regarding instruments, I do not agree. Another typical comment is something akin to the fact that carbon fiber instruments don't sound like wood instruments. With this I do concur. My opinion on this matter is that carbon fiber instruments are every bit as good as wood instruments. The voices are different, yes. Much like a harpsichord is different from a piano, but an intelligent analysis and comparison of pianos and harpsichords would not result in the declamation that pianos are not as good as harpsichords. They are two different instruments. Both with their own distinct voices. As is the case with carbon fiber instruments and wood instruments. I've seen musicians judge carbon fiber instruments with the dismissive "It's not a wood instrument." This is akin to hearing a wood instrument and declaring it to be inferior because it's not a metal instrument. Or dismissing a piano because it's not a harpsichord. As much of an acoustic purist as I am, I welcome and embrace the new carbon fiber instrument technology. I believe it to be a fine alternative to wood instruments, with its own distinct voice, with its own advantages. I doubt that a paint artist would ever say with disdain that they had too many colors in their pallet, or too many brushes. The carbon fiber instruments are a new color in the acoustic instrument pallet. Note that I am focused on tonal and voicing considerations; I'm not even broaching the topics of wood instrument susceptibility to temperature and humidity, or the argument regarding conservation of rare and declining availability of tonewoods. 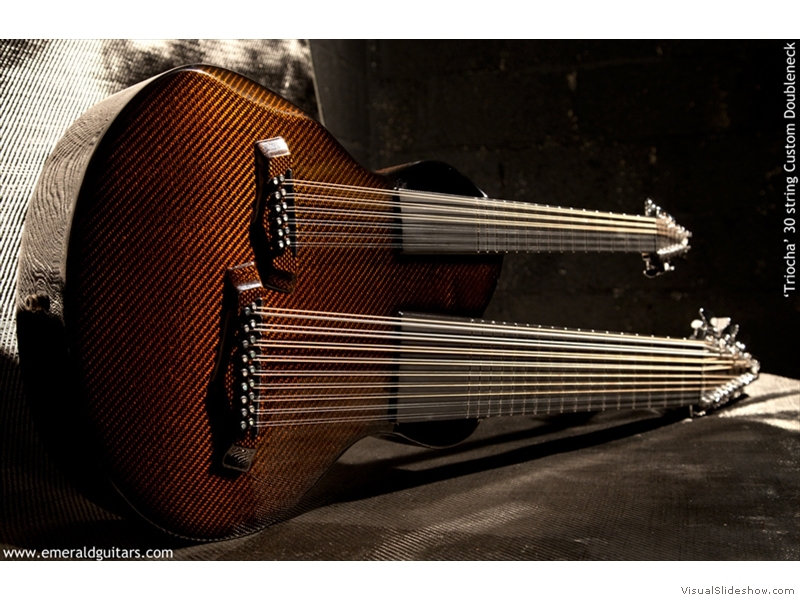 If you are a musician reading this, and you've been curious about carbon fiber instruments, I encourage you to approach them with an open mind and open ears. No, they don't sound like wood instruments, just as wood instruments don't sound like metal instruments, or a piano doesn't sound like a harpsichord. Take them on their own terms, listen to each and find the unique and individual magic they offer. In conclusion, my opinion is that wood instruments and carbon fiber instruments are equals. Just as there are a wide variety of tonal characteristics possible with tonewood, there are as many variations with carbon fiber and other composite materials. Which you prefer is a personal decision. Carbon fiber brings a new color to the pallet, and that is never a bad thing. Epilogue 2: As further evidence that the 30-string might not have been possible in wood: normal string tension on a 6-string acoustic guitar with medium-gauge strings is about 160 pounds. 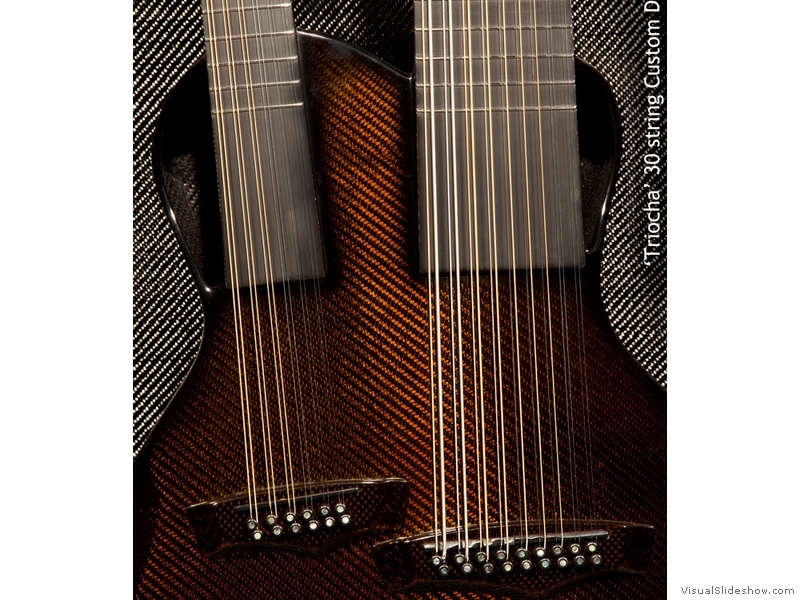 String tension on the Triocha comes in at over 500 pounds. Hover over the center image for slideshow controls. *These are the octave and unison tunings; I will be using many intervallic tunings. For string sets and gauges, refer to the Strings and Tunings page.